Where we last left off we were driving through Northern California along famous highway 101, enjoying a beautiful day along the coast. 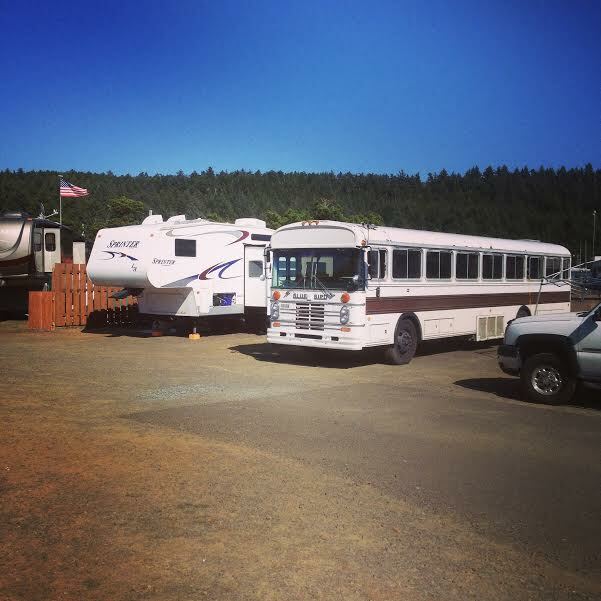 We had spent the night in Fortuna, parked behind the Eel River Brewery. 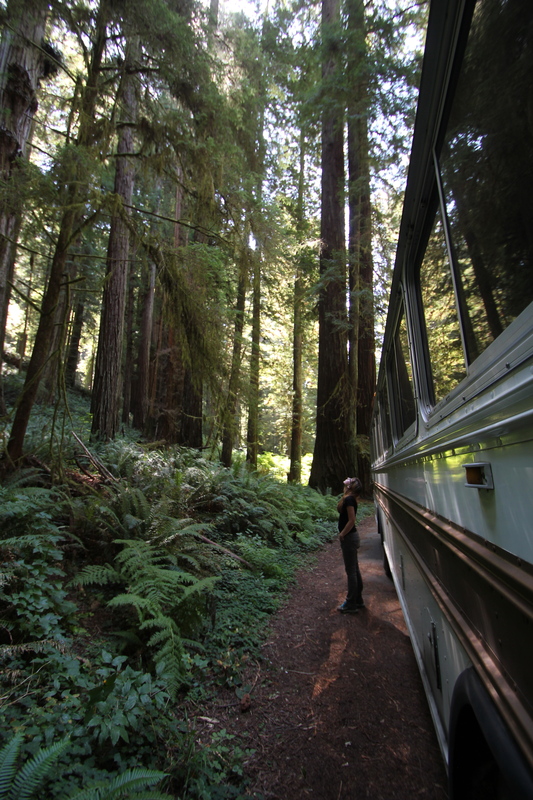 Our goal for the day was to drive through some of the redwoods, cross the Oregon border, and find a place to camp close to the beach. This was the big day! 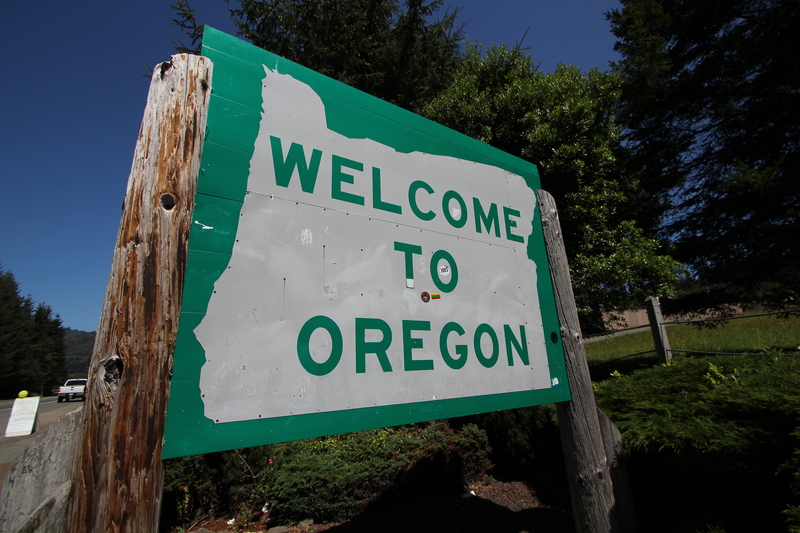 We would be seeing that “Welcome to Oregon” sign for the first time in almost 2 years. Crescent City was the last large town before we got to Oregon, I recall some wild stories from my Grandpa’s early days working as a logger here. Back when they worked hard and partied even harder. 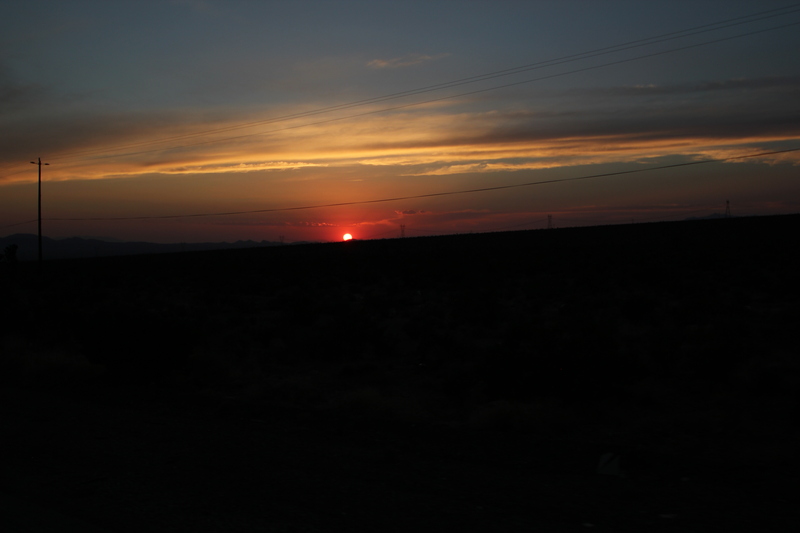 We passed through without stopping, as we were too excited to get to the border. 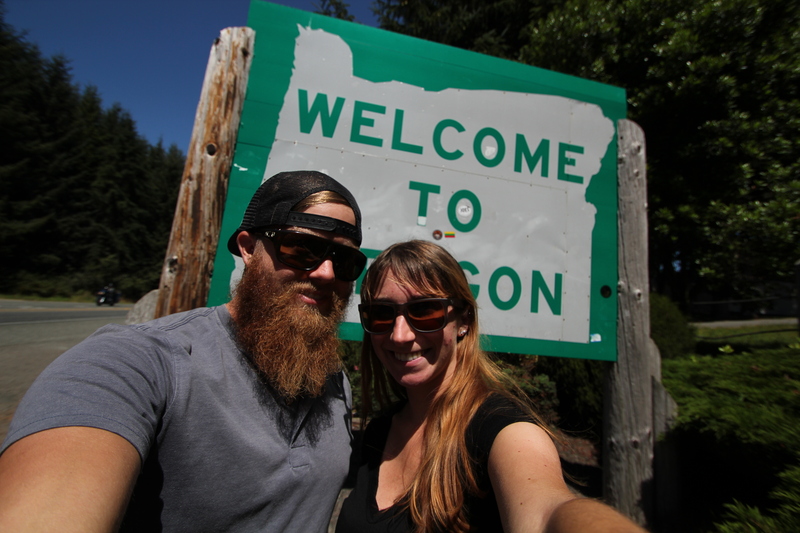 When we finally saw that Oregon sign we had to stop and take some photos with the bus. 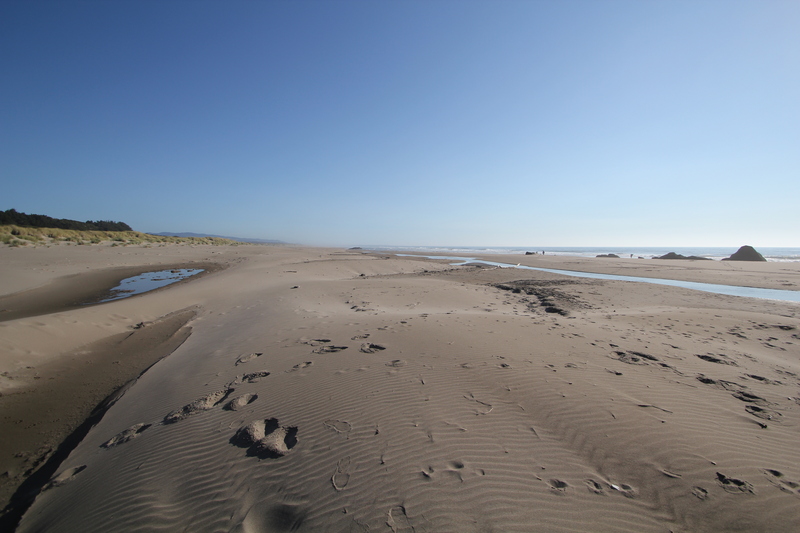 We couldn’t believe that we were finally here, the southern Oregon coast is so beautiful! 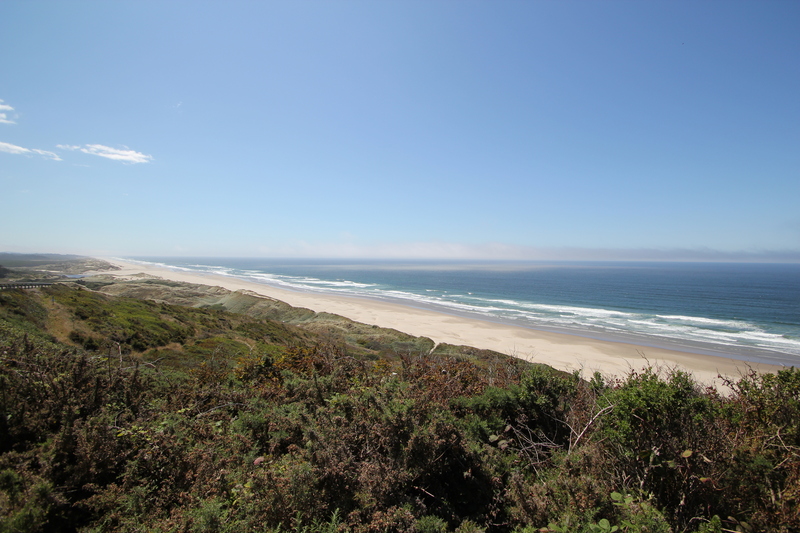 After we took enough pictures we kept driving, heading along the coast until we reached Bandon, OR. 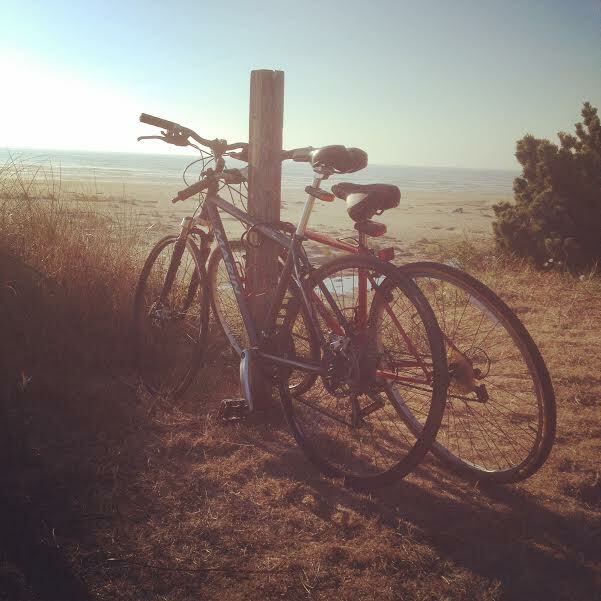 This is where we would be camping for the night, at a nice little campground just a short bike ride from the beach. 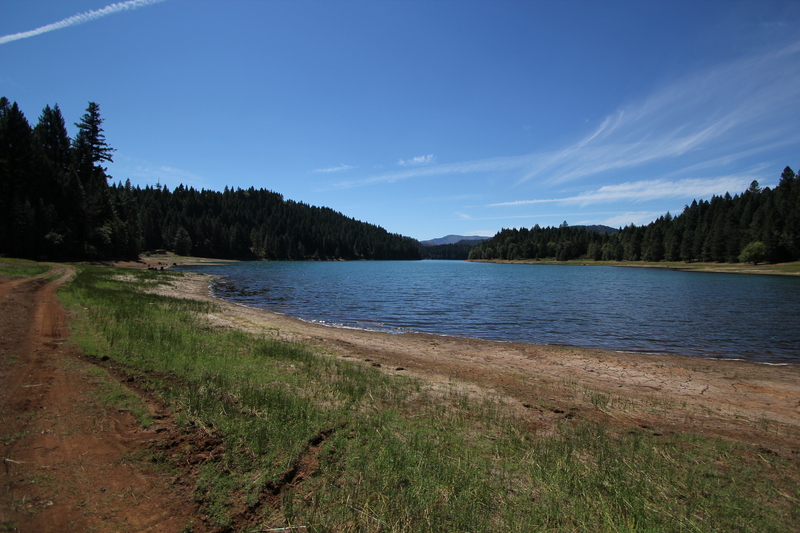 Once we were settled into our camping spot and said hi to the neighbors we unloaded our bicycles and rode down to Face Rock State Park, where we locked up the bikes and hiked down to the sand. The beach was mostly empty so we got to enjoy a beautiful summer evening all to ourselves. After cleaning up the dinner dishes we crawled into our cozy bed and felt the cool breeze come in through our windows. The next morning we were on the road early and heading for the northern end of the Oregon coast. Before we left Bandon we had to stop in at the Face Rock Creamery, where we enjoyed sampling all of their delicious cheese. 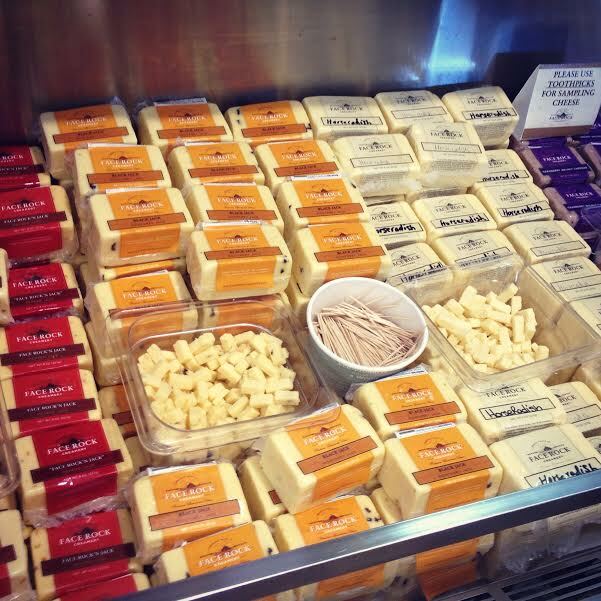 We couldn’t leave without buying a couple different types, as well as some of the best butter ever. 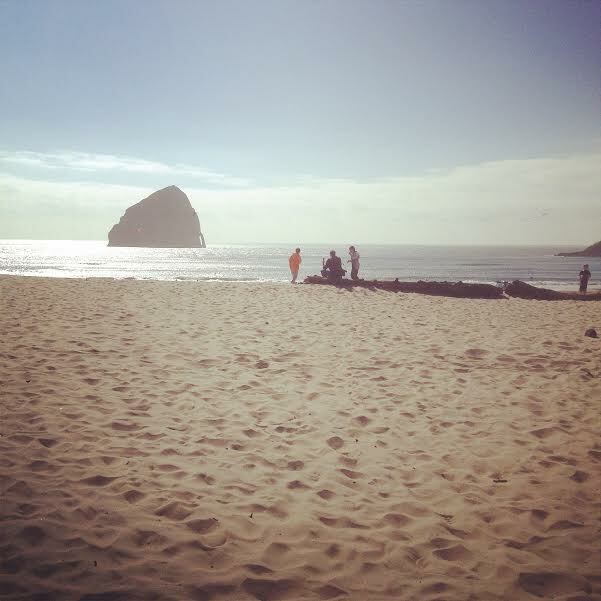 Our next (and last) stop on the trip before reaching home was Pacific City, one of our favorite beaches on the whole coast. 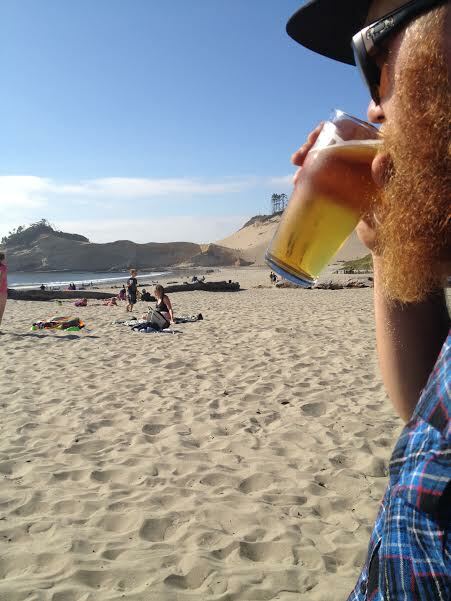 A big part of that is due to the Pelican Pub, an award winning brewery right on the sand overlooking the ocean. Even though it was the peak of the busy season we managed to snag an RV campsite at the county park directly across the street from the beach and the pub. What luck! 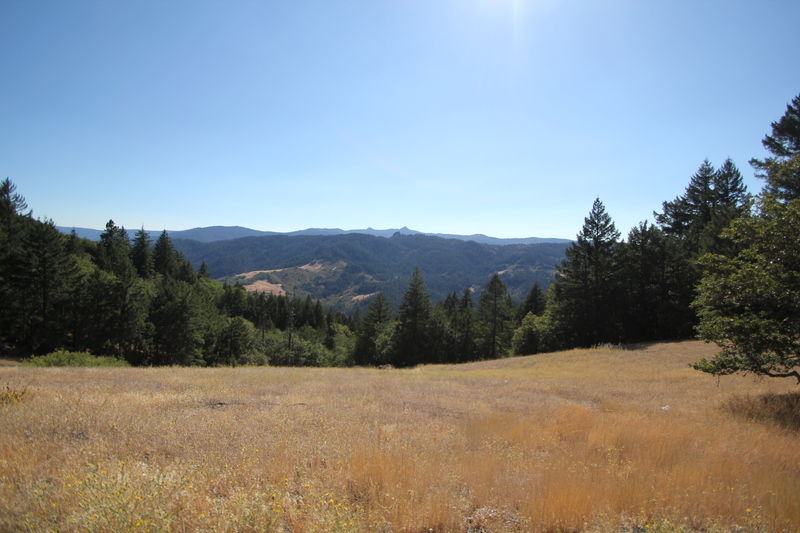 The tricky part is that the site was listed as only allowing an RV up to 23′ long, so when we called to book the site I asked the camp host to measure the site, and she reported that the absolute maximum length that would fit would be 35′. Dang, should we attempt to squeeze our 40′ bus in there? 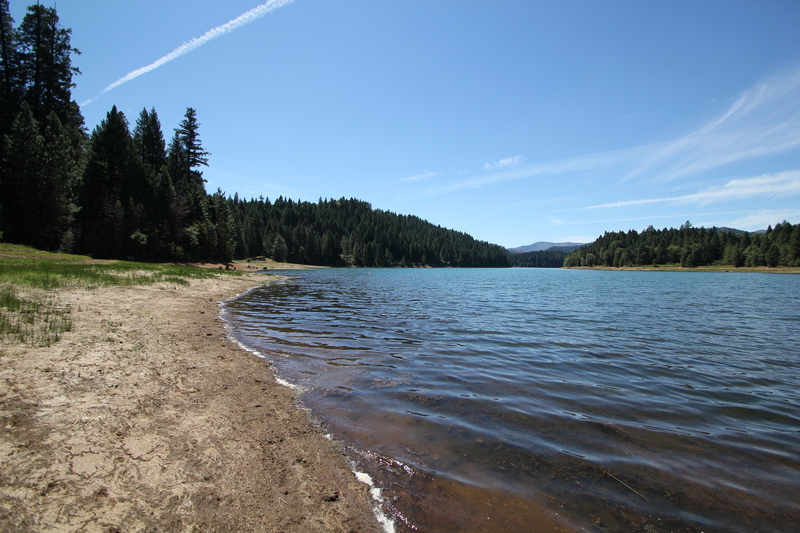 We didn’t have any other options so we crossed our fingers and headed for the campsite. When we got there we unloaded the motorcycle and took the rack off the back, giving us just enough clearance to fit in the site with 2 feet to spare. Woohoo! We were ready to have a couple beers at the Pelican and wait for our friends from Portland to join us for our last night camping. While we were relaxing on the back deck at the pub we started chatting with the guy next to us, and quickly discovered that he was riding his bicycle around the US. Daniel was a very interesting guy, and it was a lot of fun to exchange travel stories with him. 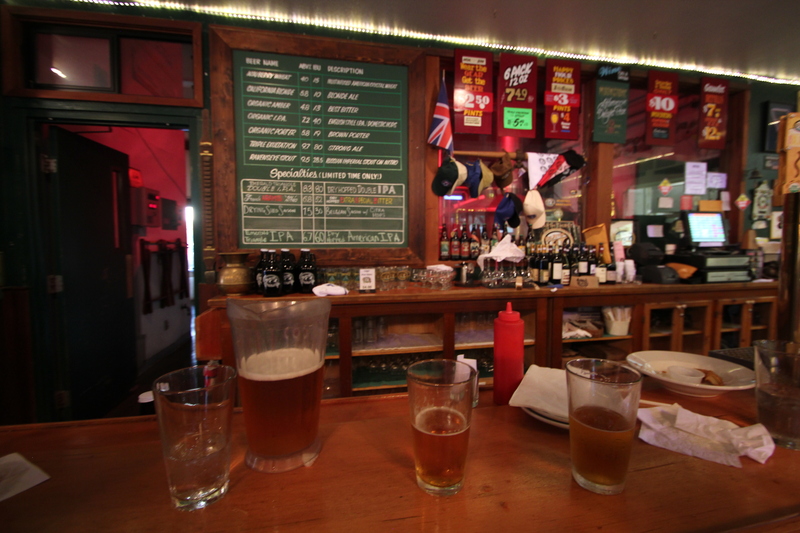 His trip is mostly centered around craft beer, kind of like ours is, so we had plenty to talk about. Pretty soon we offered to let him camp at our site with us, so he joined our group for the rest of the night. You can check out his travel blog here. Pretty soon our friends from Portland arrived, and we went out to the beach and built up a nice fire to sit around while we enjoyed a few more beers and some good company. There was a lot of catching up to do after being away for a while, and it was nice to finally be camping with some of our oldest friends. That night the floor of the bus was packed with sleepy campers, which is always a fun experience. The next morning we made a big breakfast for everyone, really putting our little kitchen setup to the test. It worked wonderfully, and we even got to make some beermosas using Widmer Hefeweizen, which is a beer that we really missed. 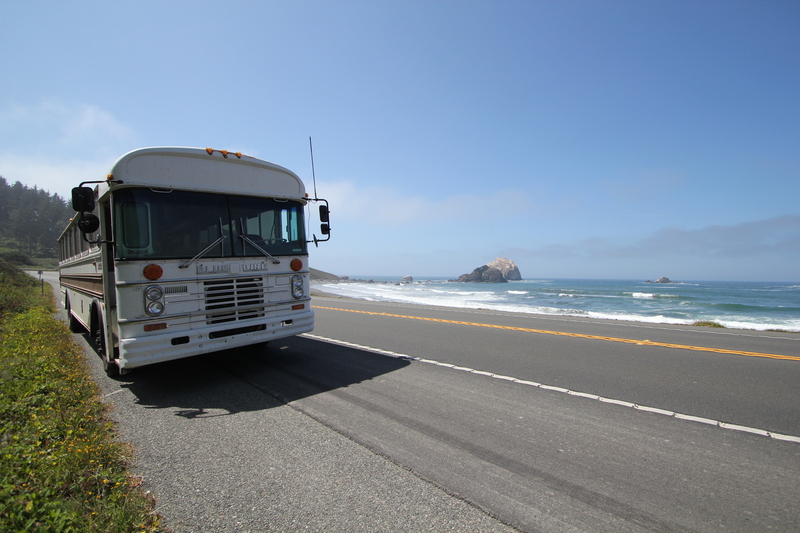 We packed up our camp and prepared for the drive up to Tillamook and over to Portland. 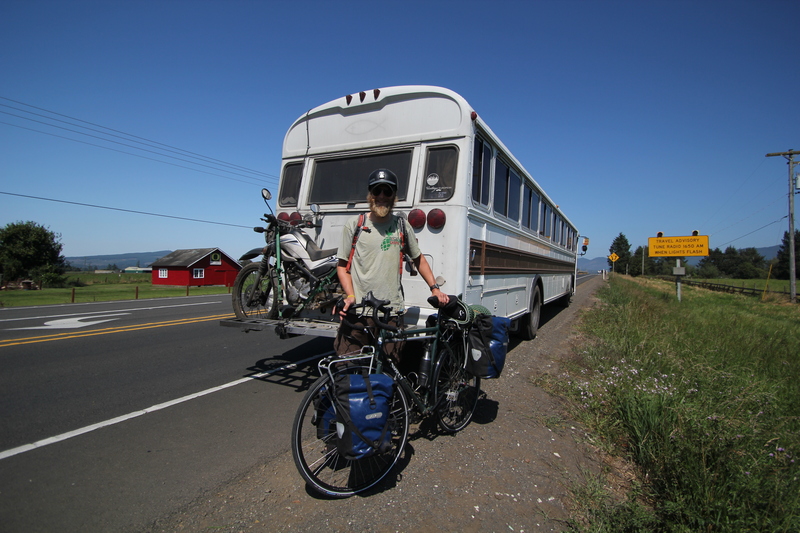 Daniel was heading toward Tillamook, so we loaded his bicycle up and gave him a ride. He was very excited to get to experience riding in the bus, and we always enjoy having extra passengers! Having Daniel along for part of the trip was really fun, it is always nice to meet another unconventional traveler. 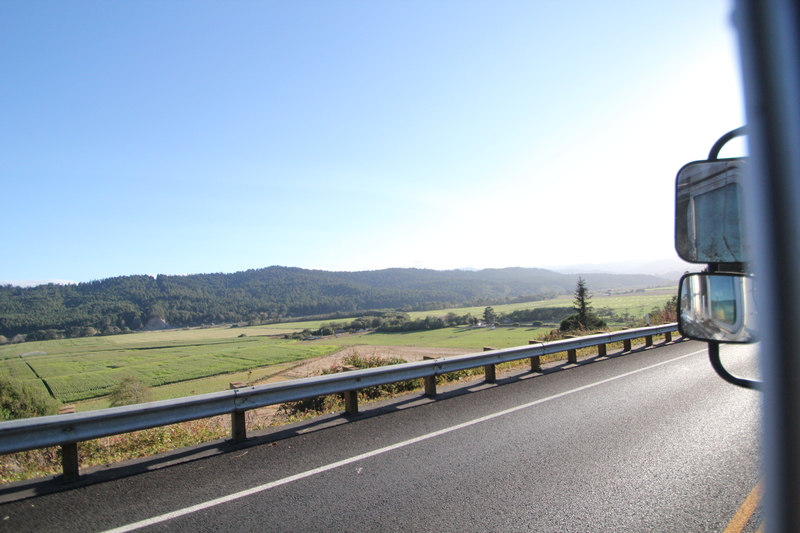 After dropping Daniel in Tillamook we turned onto highway 6 and headed toward Portland. 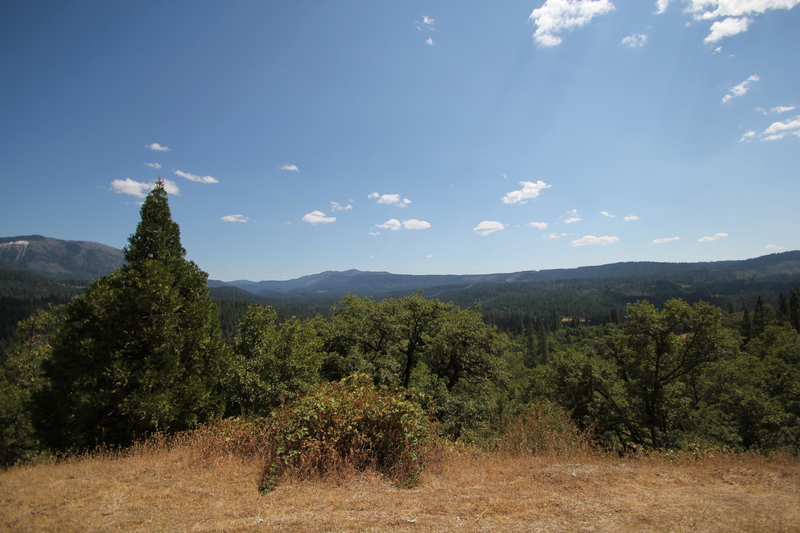 We were going to park at my moms property in Sherwood, where we would meet a large group of family and friends that had gathered to welcome us home. Getting to see so many people that we’ve been missing all in one place was a real treat. It was such a surreal experience driving through all these familiar towns and roads. 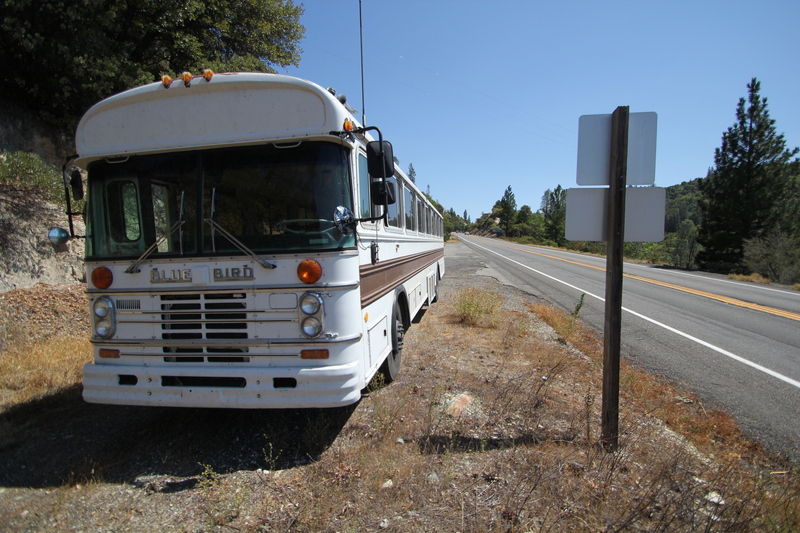 After driving this bus all over the country in unfamiliar places we were finally home. 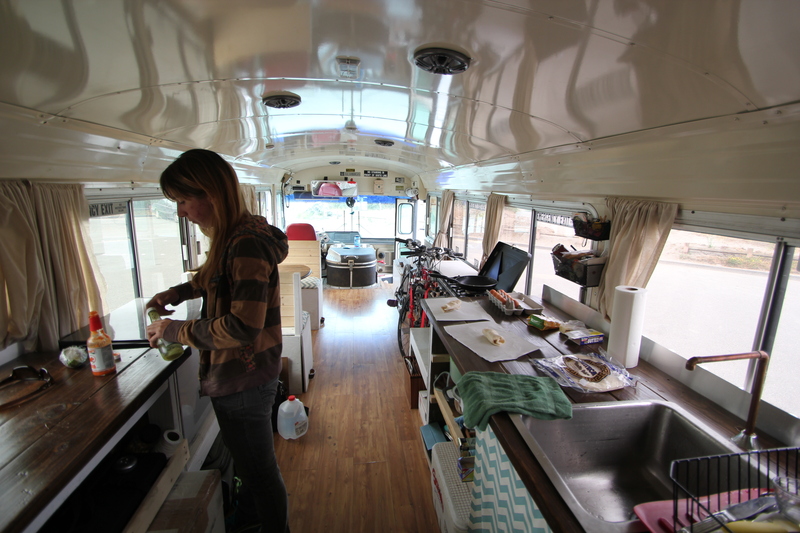 We are so excited to be here and so proud that our old bus made the journey without much of any issues at all. It has carried us safely and in style through some of the most interesting terrain in the country and hasn’t let us down. 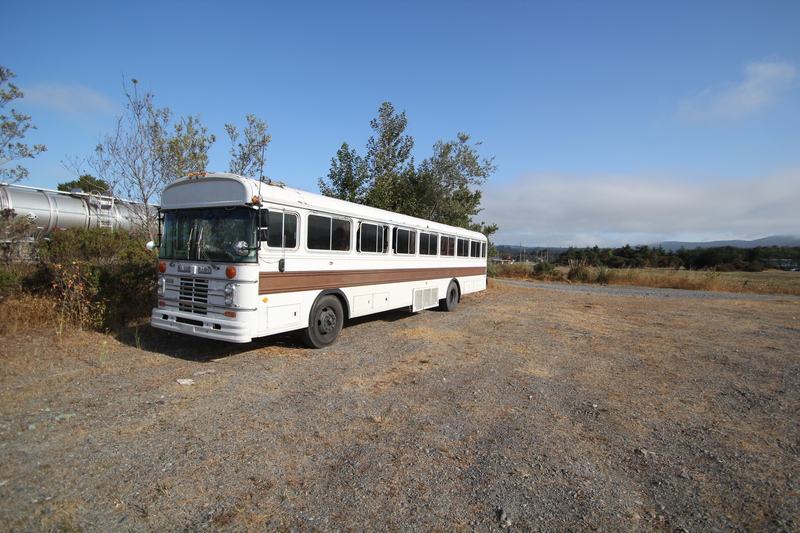 Now we are working at finding jobs, finding a place to park the bus and work on it some more, trying to decide if we are going to live in it full time or just use it as a camping rig. So many questions! 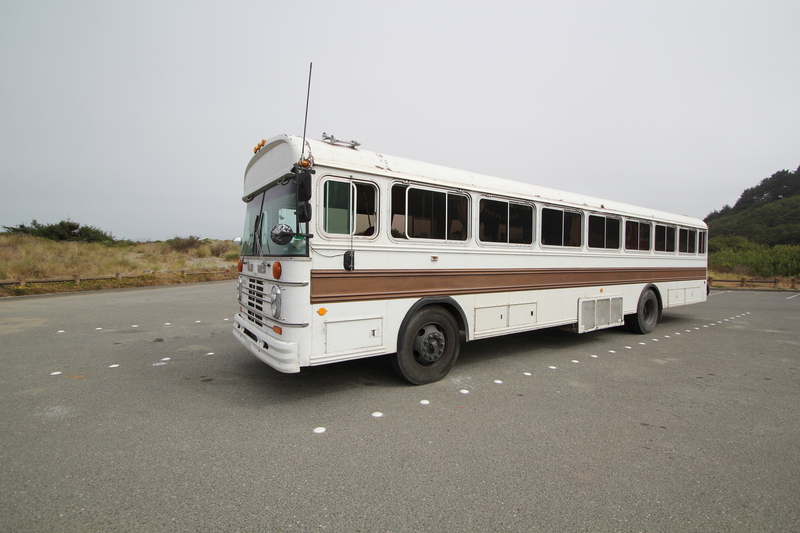 We will be keeping this blog updated with any interesting bus adventures or additions to the project. Thanks for following along with us! Apologies everyone for the lack of updates lately. 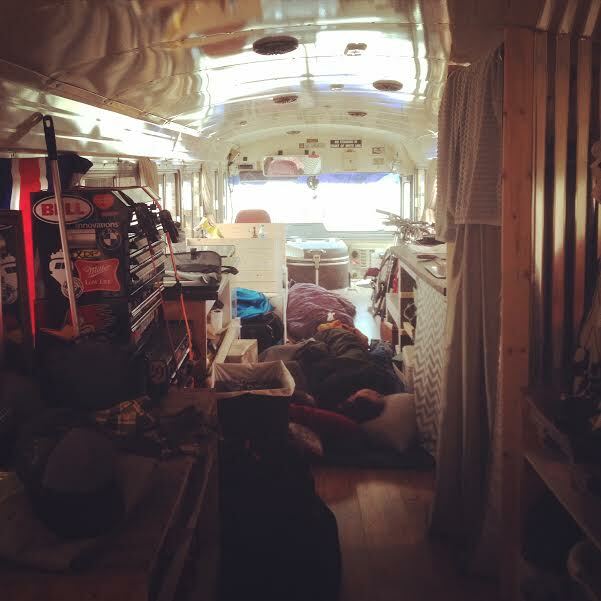 *Spoiler Alert* We have made it back to Portland and our time has been consumed by family and friends, as well as job hunting and figuring out what to do with the bus. Where we left off, we had been in San Francisco for several days enjoying some great friends and an amazing city. 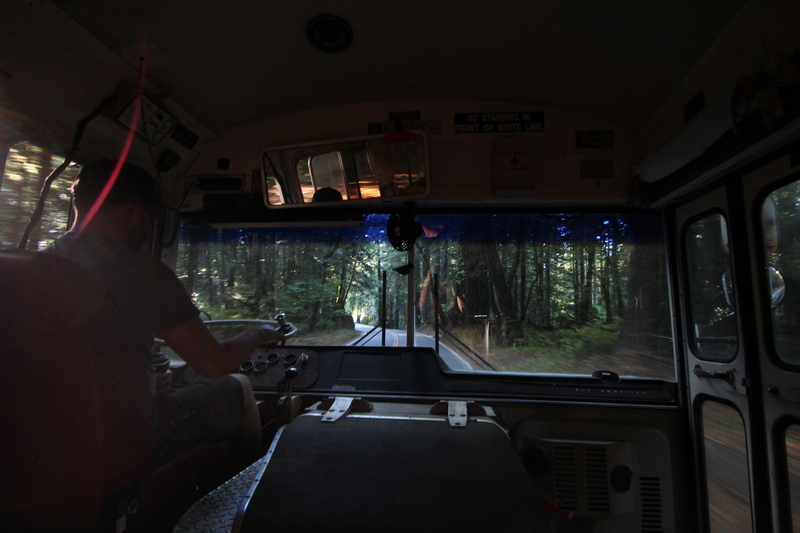 After we said our goodbyes we climbed back aboard our trusty Bird and continued our trek north. 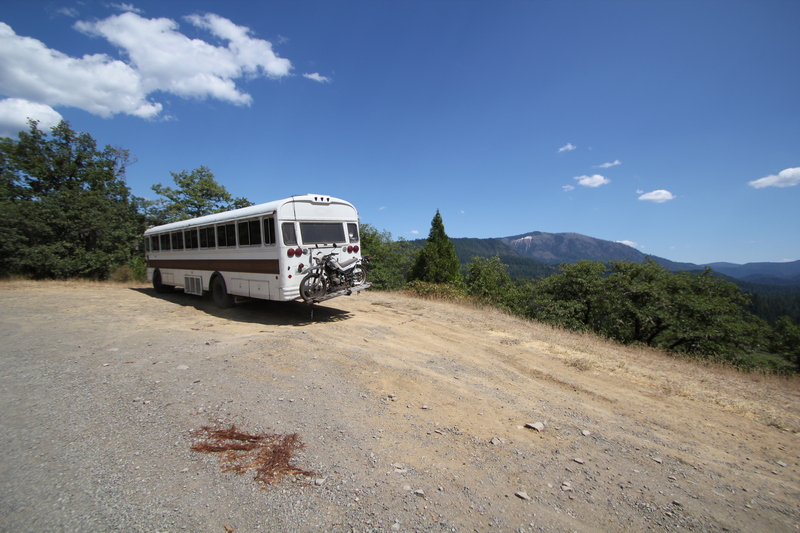 We stopped to visit some family outside Redding for a few days, and had a great time exploring some back roads in the mountains. 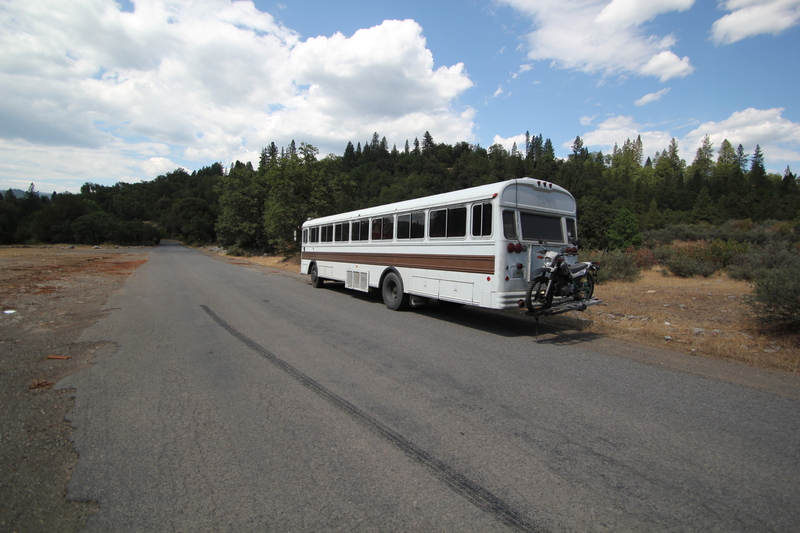 The bus does surprisingly well on rough gravel roads. 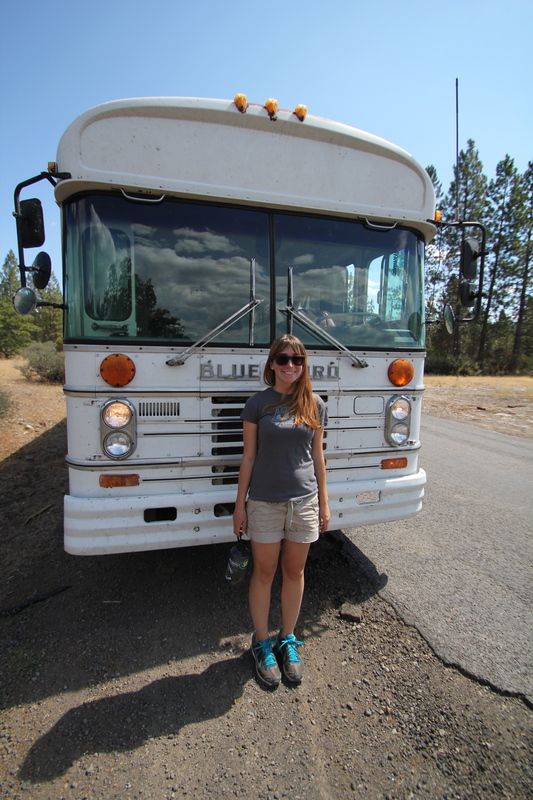 There is something to be said for the robust build quality of an old Blue Bird school bus. Lindsey and I talked it over and decided that we would have much more fun following the coast up to Oregon, rather than taking I5 straight through the middle. We didn’t want to trip to end, so extending it by an extra 2-3 days was a welcome idea. 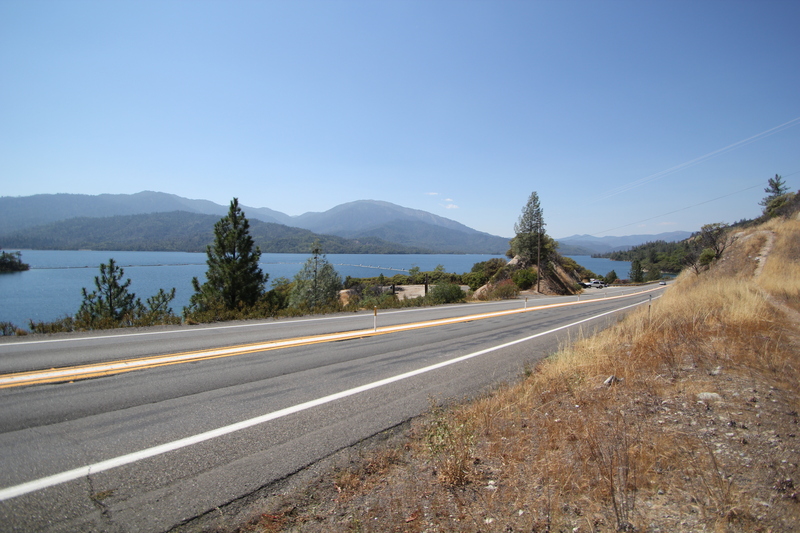 Leaving Redding we headed west on highway 299, winding our way up and down through the mountains. 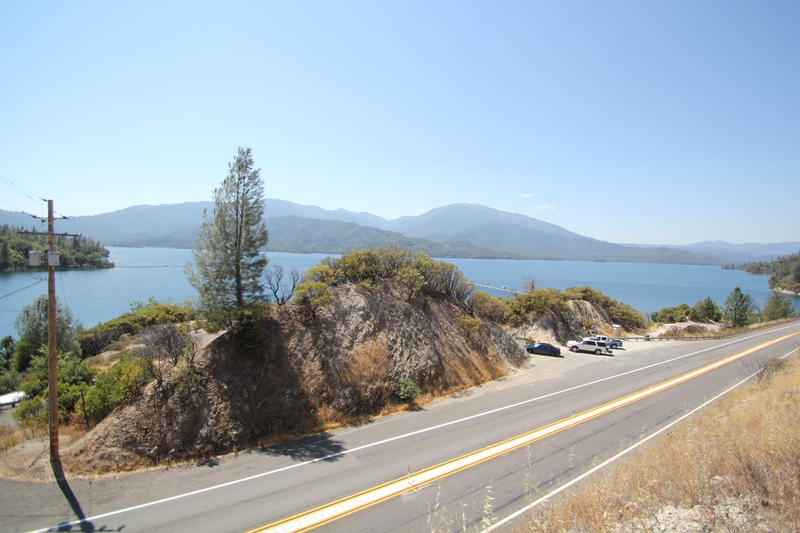 It was hot out but we were really enjoying the drive, these were some of the greatest driving roads I have been on for a while. The closer we got to the coast and the further we got into the forest the more it cooled down. 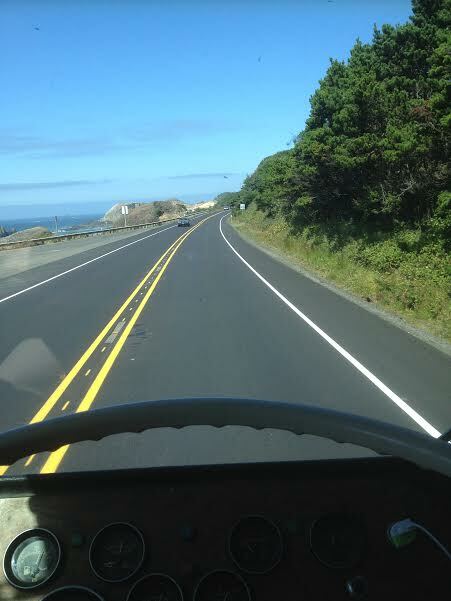 We marveled at the beautiful scenery going by, and even though I had to really hustle the bus along the curvy road we were really enjoying the drive. Little did I know what waited ahead would make me regret that statement later. 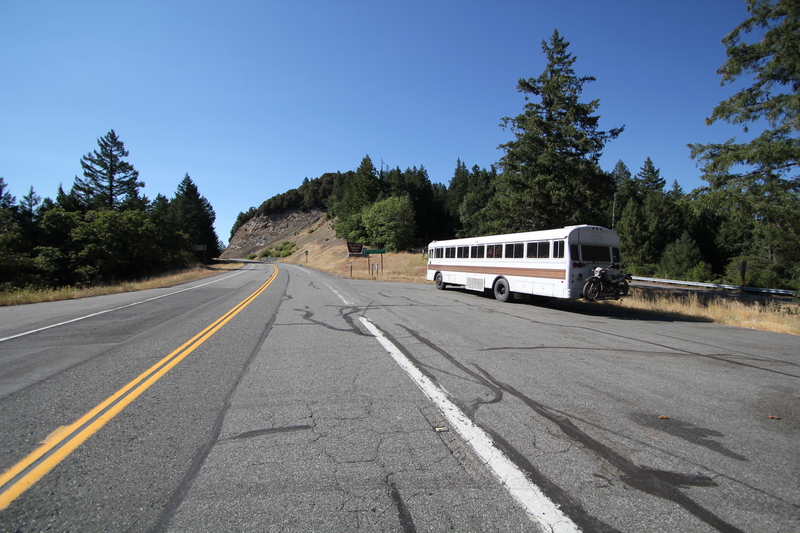 We passed a few hitchhikers along the highway, but they always seemed to be waiting along the guardrails next to a steep drop off where there was no room to pull over, so we continued along without extra passengers. Pretty soon we were turned off 299 at Douglas City and headed down highway 3 south. 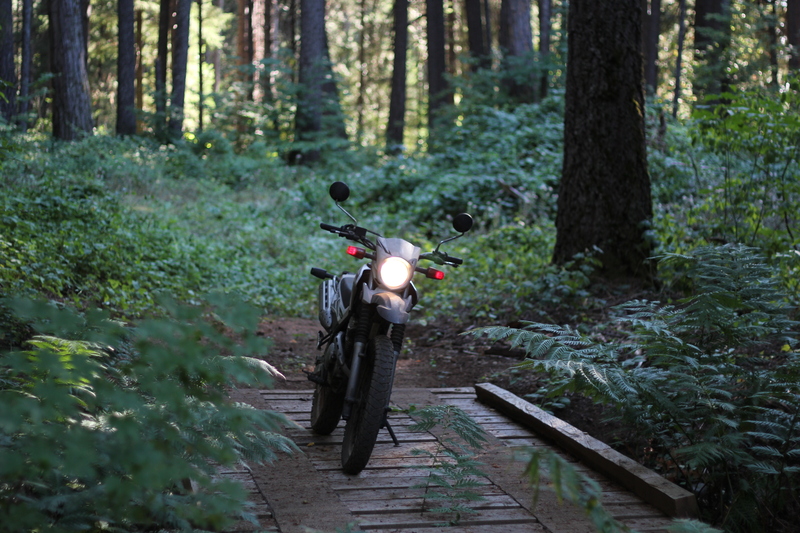 The road got a little narrower but it wasn’t enough to cause alarm. We were really enjoying ourselves now, cruising through some beautiful forests and along some small rivers. 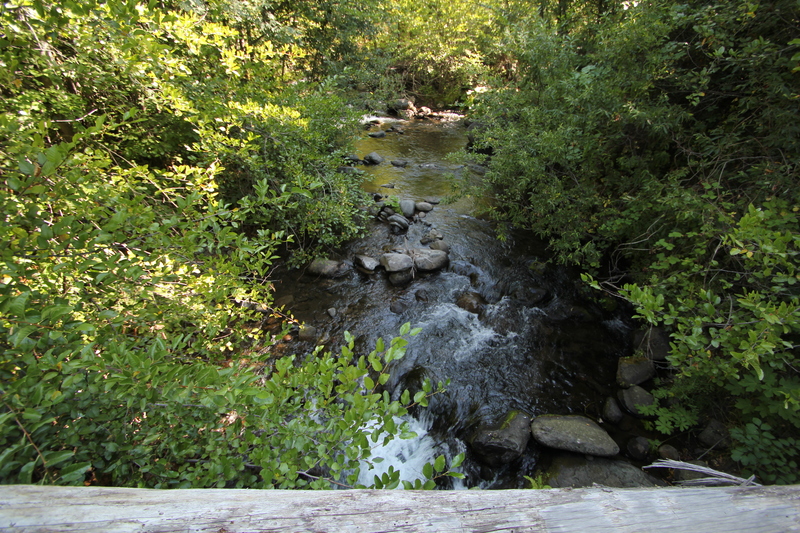 It was so nice to be out of arid Southern California and see so much greenery and water flowing. 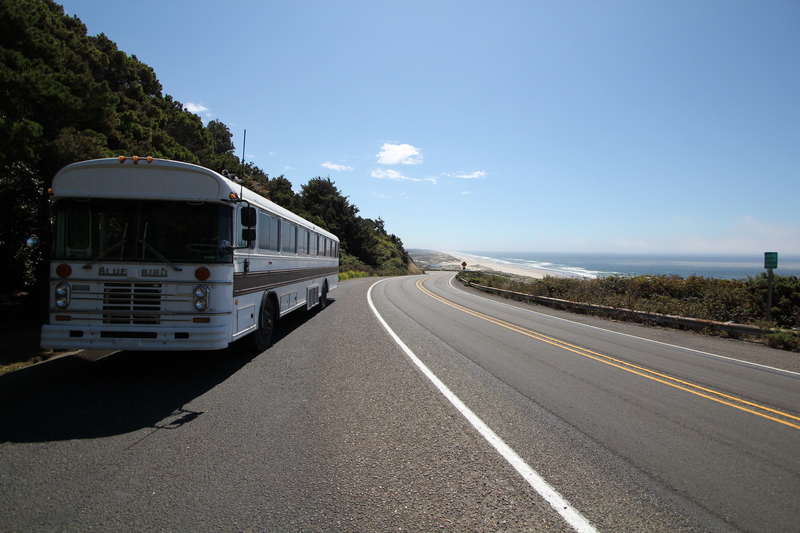 Eventually we turned onto highway 36 and made for the coast. 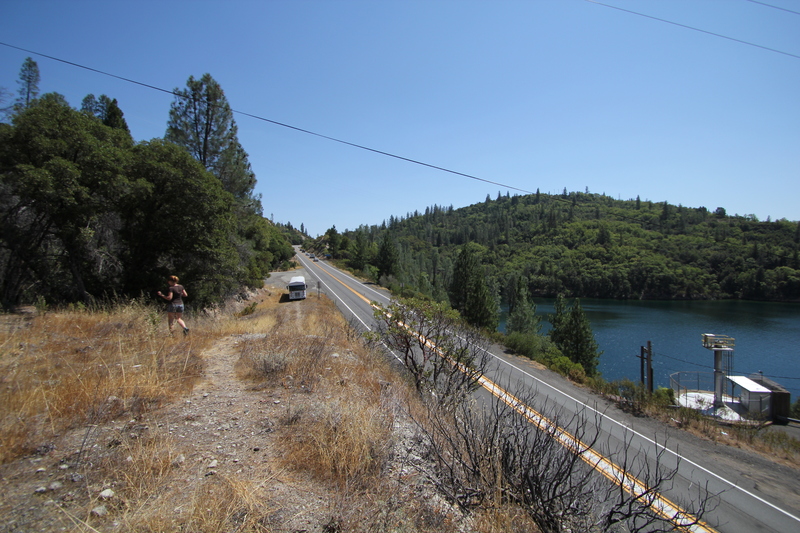 This is where things got interesting, as the road narrowed so much that most of it didn’t have a yellow center line. We snaked our way around the mountain for miles, trying not to look over the side at the steep drops. Crossing our fingers at every switchback, hoping there wasn’t another vehicle coming from the other direction, as we needed most of the road just to negotiate the turn. Fortunately we managed to squeeze by all the oncoming traffic and eventually made it out onto the foothills where the road opened up again. By the time we got to the bottom I was a sweaty mess. This was definitely one of the most harrowing roads we have been on so far. 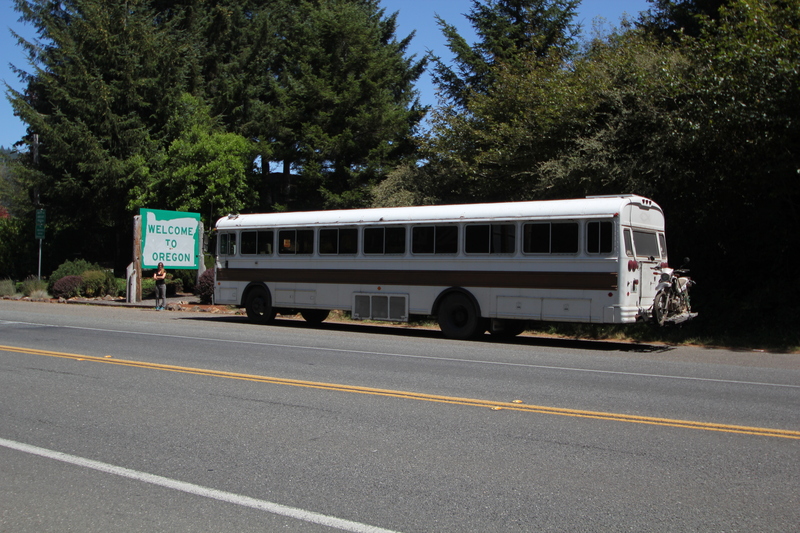 Meeting up with highway 101 again we headed to Fortuna, where we planned to spend the night. 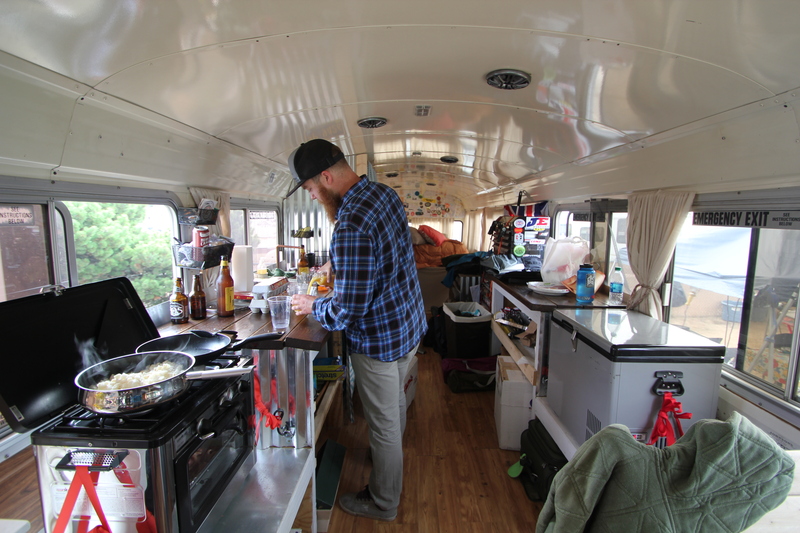 A few days earlier Lindsey had found the Eel River Brewing Company online, and learned that they allow overnight RV camping, which we eagerly took them up on. 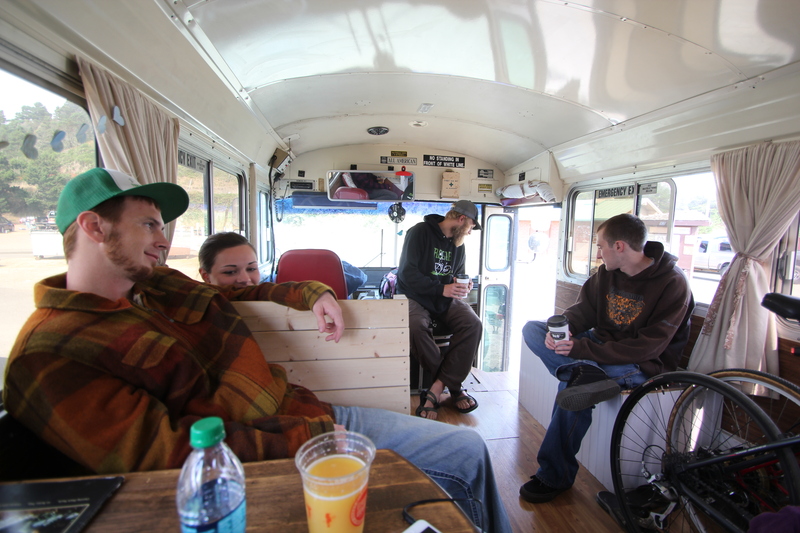 We found the brewery and parked in their large gravel back lot, which was perfect for the bus. It was so nice to relax with some cold fresh beer after such an intense day of driving. Spending a peaceful night in the bus we got up early and hit the road. 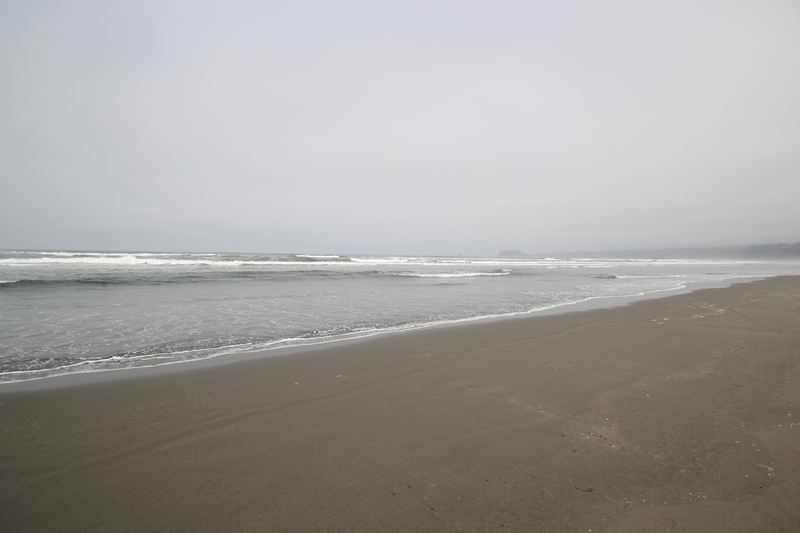 We stopped at a state beach just north of Eureka and made some breakfast, then walked down to the water and enjoyed the cold sand on our bare feet. 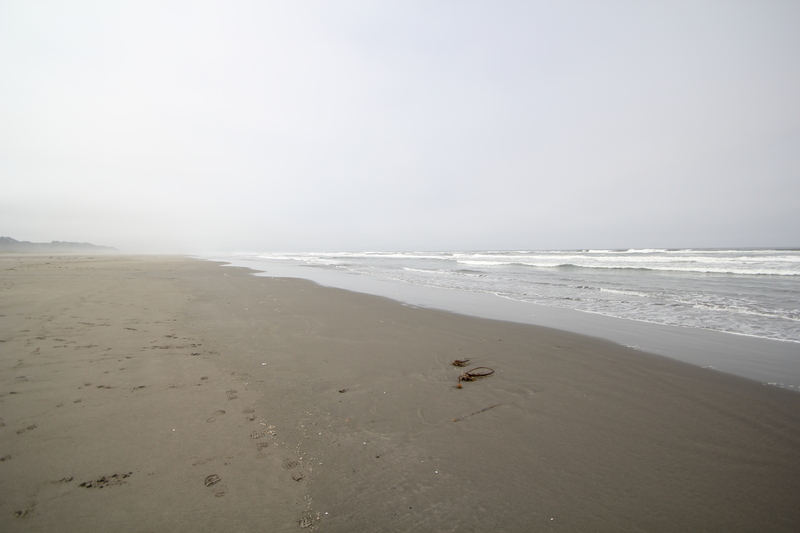 Driving along the coast through the chilly early morning fog made me nostalgic for the days I spent with my grandparents at the beach when I was growing up. The smell of the ocean rolling in the open window just added to the experience. 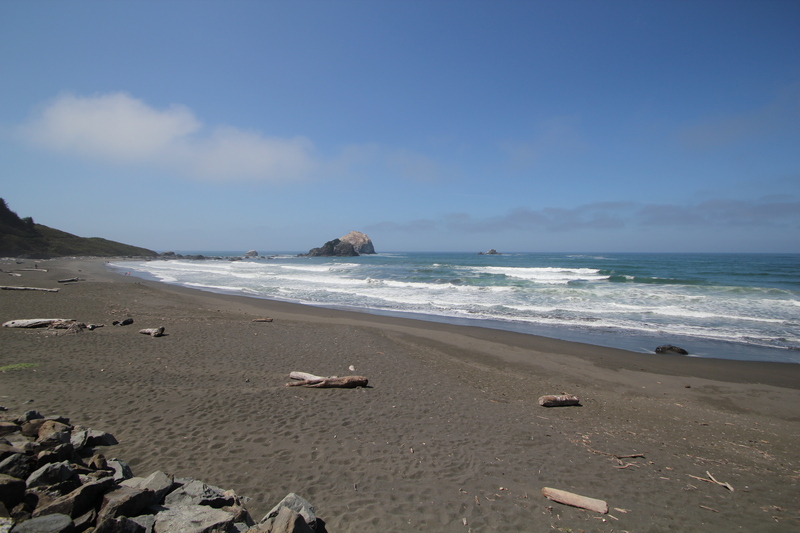 We continued our drive north, stopping at a few overlooks to watch the mighty Pacific crash against the rocks. 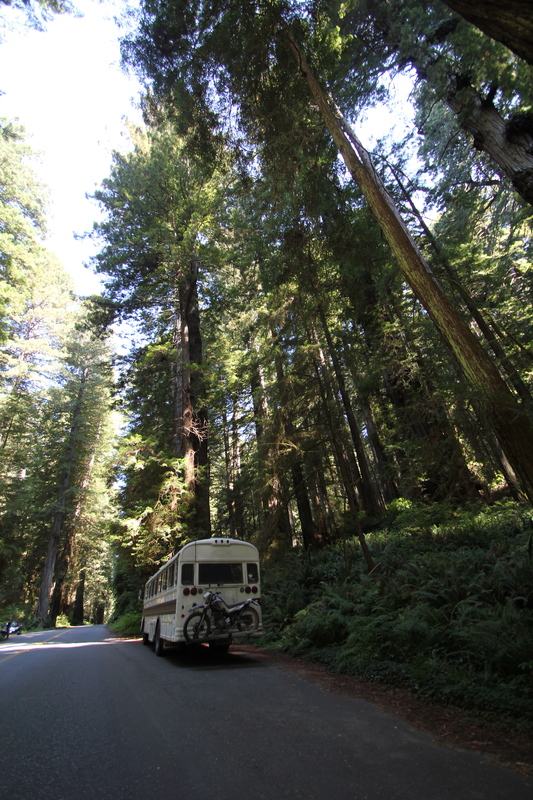 Pretty soon we found a scenic byway that led us through the Redwoods National Park, where we were awe struck by the size and beauty of the old trees. 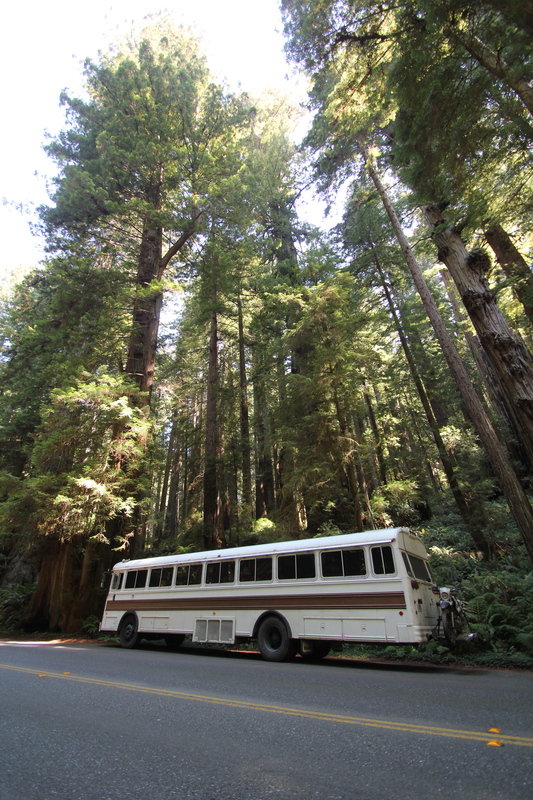 Parking the bus at the base of some of these trees we marveled at their immense size, making us feel so tiny and unimportant. 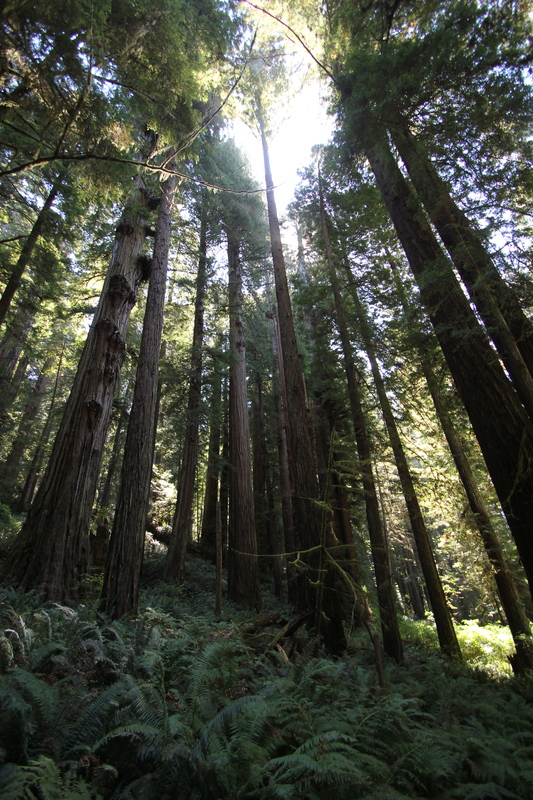 I can see how the Redwoods hold such a sacred place in many peoples minds and hearts, and I can’t wait to go back and spend some more time camping and exploring around the park. 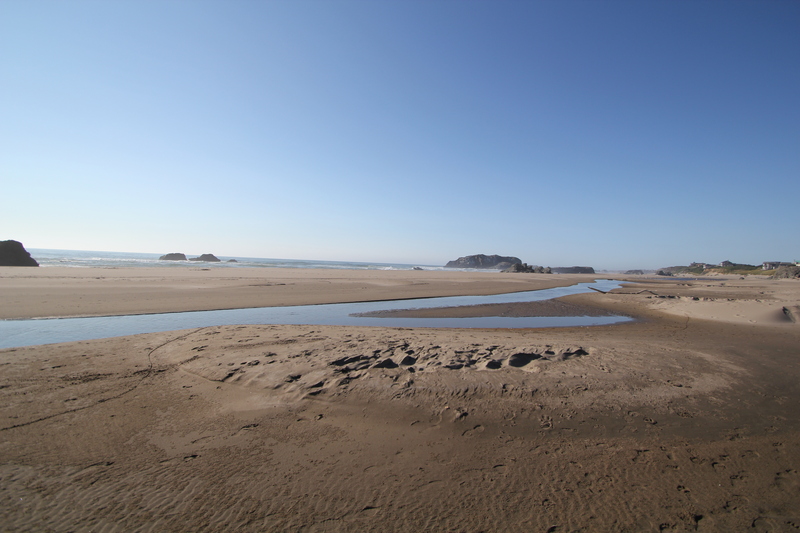 As we drove north toward Crescent City a new reality hit us: it was only a few more miles until we crossed into Oregon, and a couple more days until we were back home in Portland. This brought feelings of elation at being back home after a year and a half, and also sadness, for the New Oregon Trail was coming to an end. It was hard to be too sad though, as it was a gorgeous August day to be driving along the Pacific Coast Highway, with the water so blue and the forests so green. It sure feels nice to be back on the West Coast. 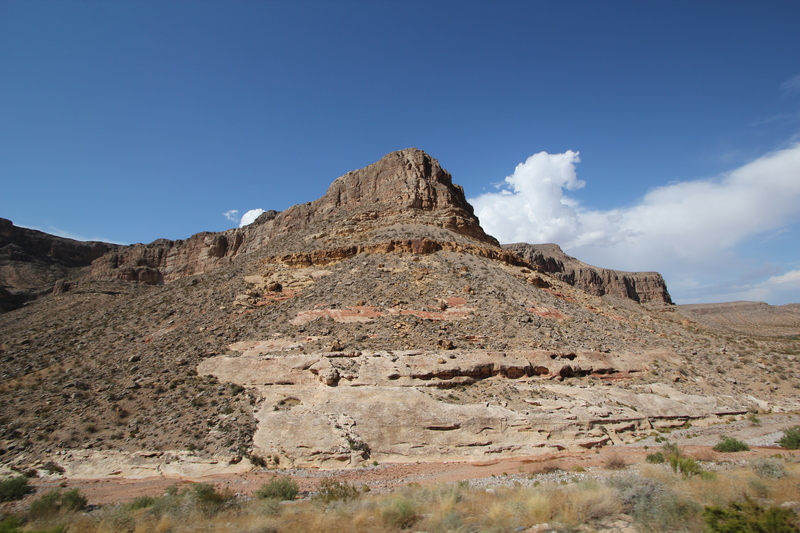 After our adventures in Utah we were headed toward Southern California. 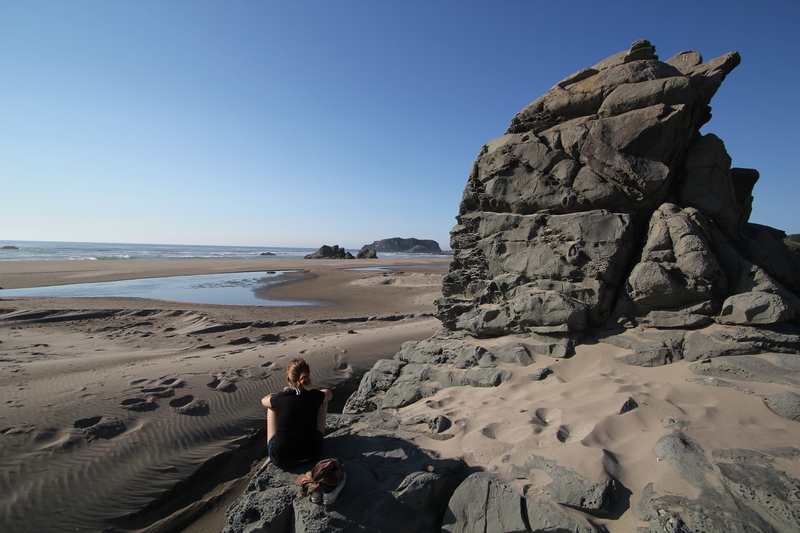 Our plans had included some more camping and exploring in the deserts of Utah, but we decided to re-route and head towards the ocean after looking at the weather forecast. We have already spent enough time in hot weather in our bus without AC, so we told ourselves that we would just have to come back in the spring. Leaving from Park City, it took twelve long hours for us to reach Riverside, where Lindsey’s Uncle and Aunt live. We rolled into their neighborhood and parked the bus on the curb a little after 11PM, exhausted and fried after driving through the desert all day. Coming into the house for a shower and air-conditioned guest room was a welcome relief. 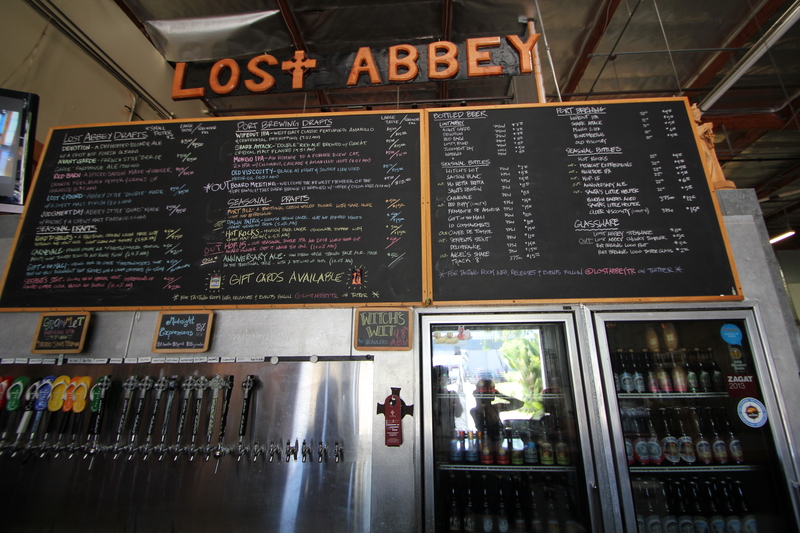 We spent the weekend enjoying the company of family, and visiting some great breweries and restaurants in the area. 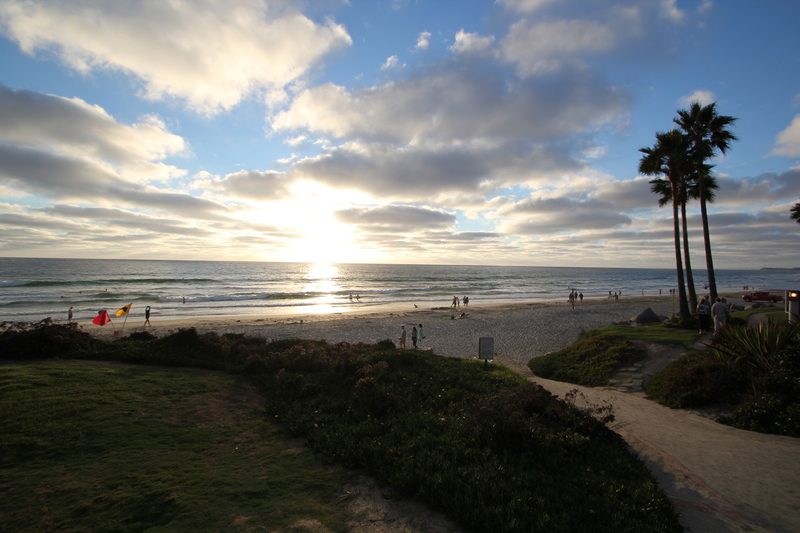 It felt so nice to be back on the West Coast! 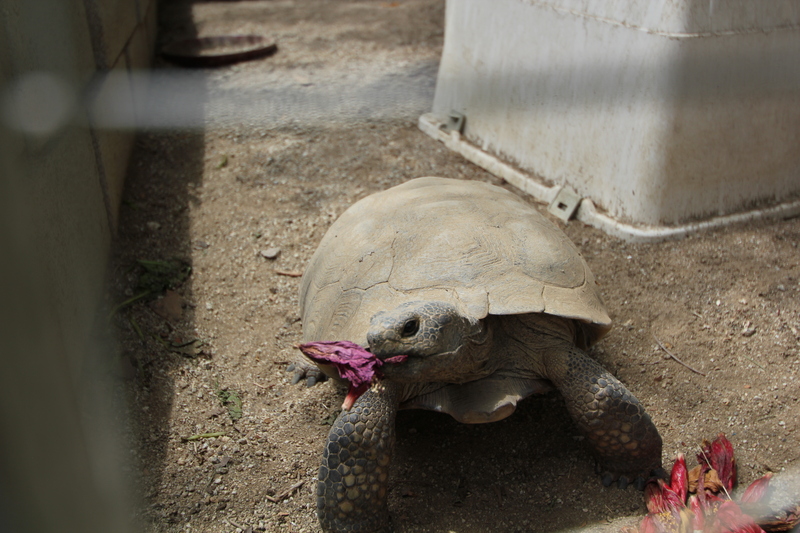 Clair and Heidi were amazing hosts, and we had a great time playing with their dogs and checking out the tortoises they have in the backyard. 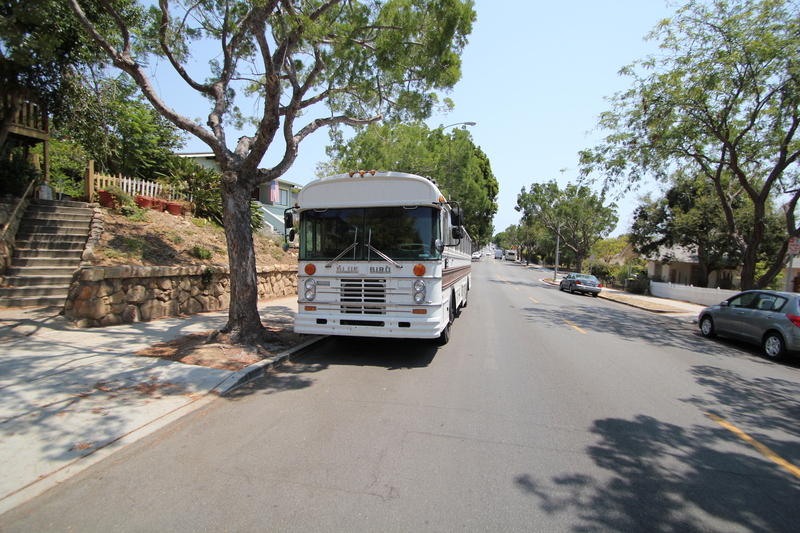 When we told them about our plans to head down to San Diego to visit friends they quickly offered us the use of their spare car, so we wouldn’t have to find a place to park our bus in the city. We were happy to take them up on the offer! 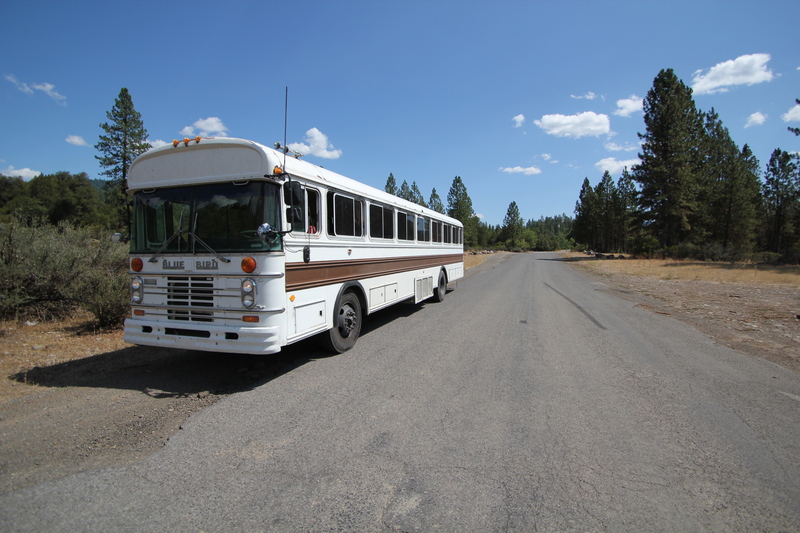 Clair had been using a repair shop close by for many years and had become friends with the owner, so we told him our story and he agreed to let us park the bus in his back lot for a couple nights while we went south. Cruising down the highway in the old Buick we marveled at how fast we could go up hills and how easy it was to get around traffic! When you drive a giant bus everywhere you forget what driving a car is like. In no time we had reached Escondido, where we met up with Lindsey’s friend Krista. It had been a while since they had seen each other so there was a lot to catch up on. 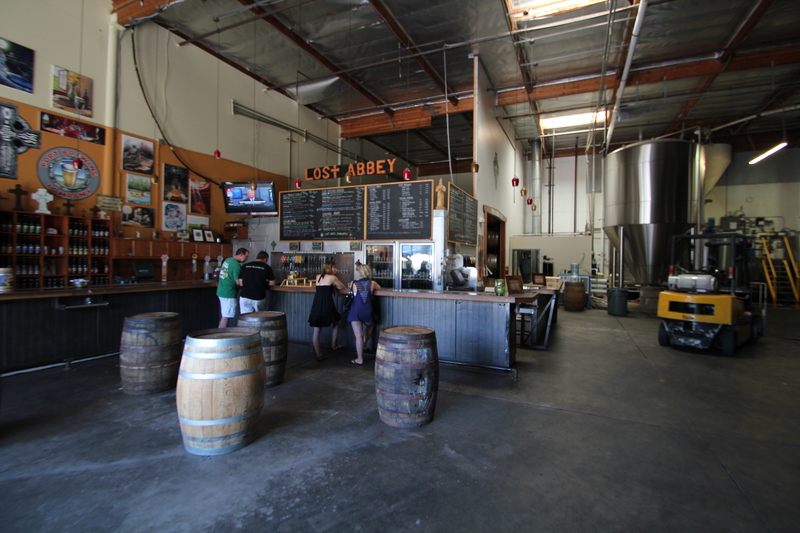 Krista took us over to the Lost Abbey, where we enjoyed a few samples of their delicious beer while we hung out in their brewery/warehouse. After getting some pizza down the street it was time to head further south, where we would meet up with Krista’s boyfriend in San Diego and spend the evening exploring the area. 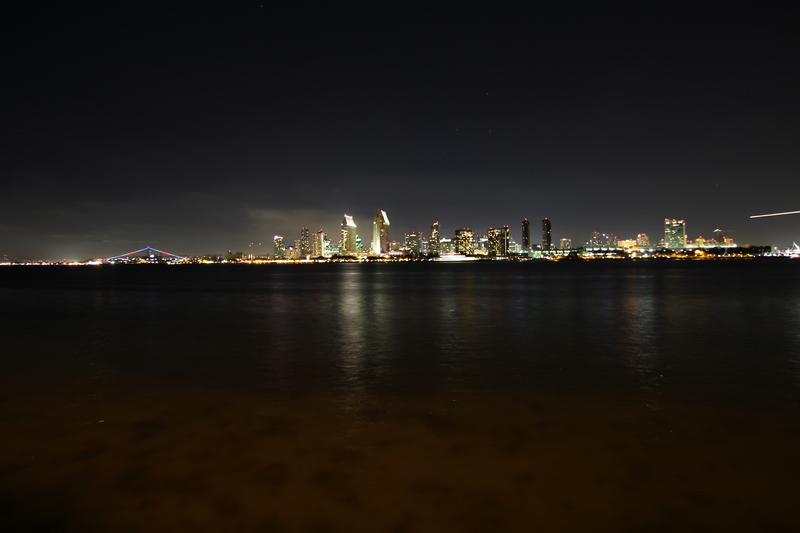 While we were in the area I also wanted to visit my friend from school that is in the Navy now, and stationed at North Island out on Coronado. I called Cody up and let him know our plans to go out and visit breweries and get food and he was excited to come join in the fun. 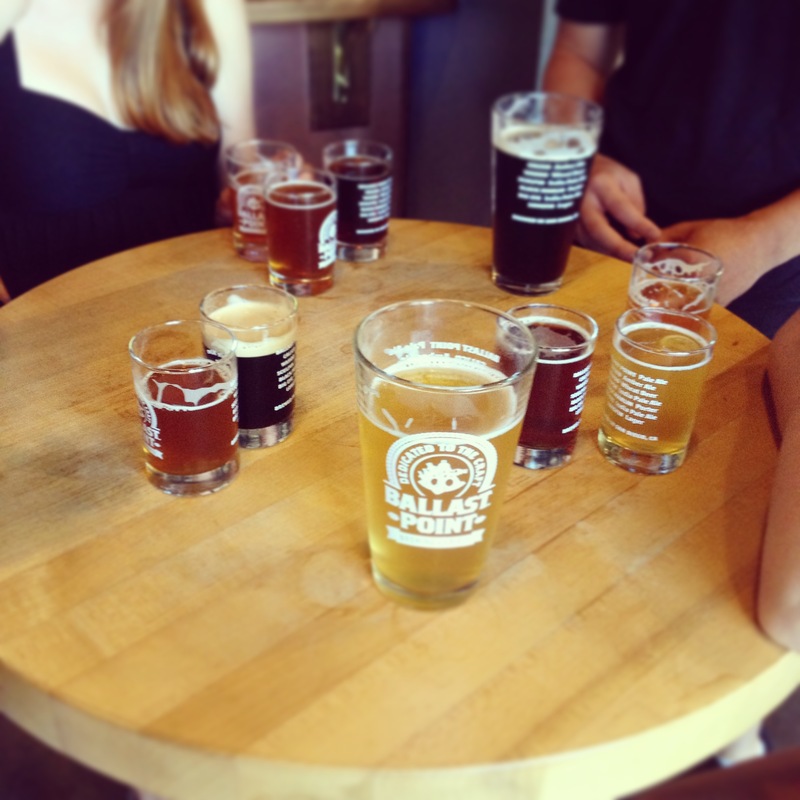 We all piled in the car and went out to Ballast Point, a popular local spot, to have a couple pints. Their most popular beer is Sculpin, a tasty IPA that isn’t too hop forward. They also do two variations on Sculpin; one with grapefruit and one with habanero. We tried the grapefruit and it’s a nice fruity addition to the already citrusy flavor. 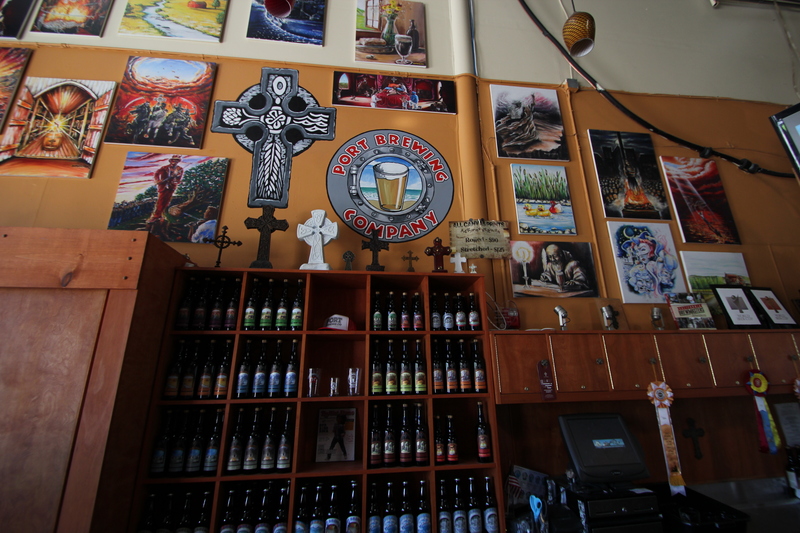 Ballast Point also offers many other great beers, as well as some nicely designed merchandise. We had to use a lot of self-restraint to keep from buying up several shirts and hats in the store. Our next stop was Urge, a trendy Gastropub with a large beer selection and fried cheese curds to die for. The next morning while Krista and Paul were at work we wanted to meet up with another friend of ours from back home who just happened to be in San Diego on a work trip the same time we were there. 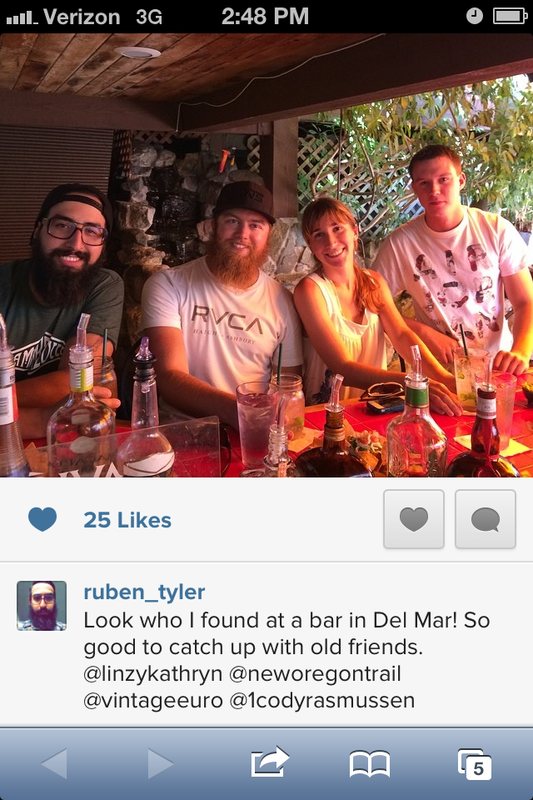 We haven’t seen Ruben for a long time, and we were excited to spend the day hanging out at the beach. 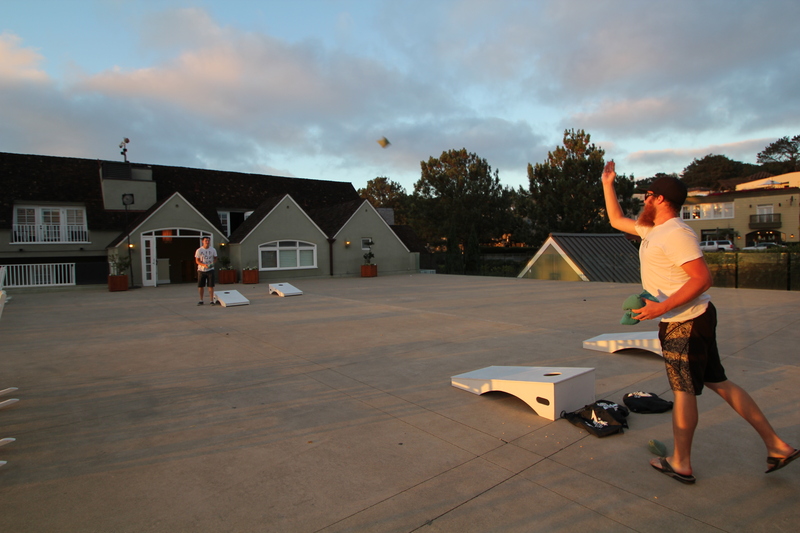 We picked Cody up at the base in the morning and drove up to Del Mar, where we met Ruben at his hotel. 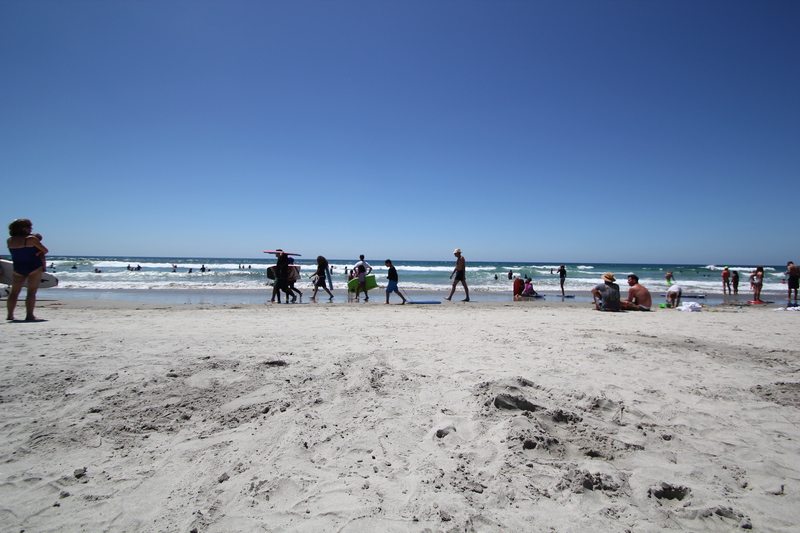 It was so nice to spend the whole day with friends from back home, relaxing on the beach and playing in the ocean. We found an interesting little bar in a lush garden area and enjoyed a slew of happy hour drinks and fresh tacos. Sadly our time in San Diego came to an end, and we made our way back to Riverside where we picked up the bus and spent one more evening visiting with Heidi and Clair. The next morning we continued our drive north, around LA and along highway 101 up the coast. 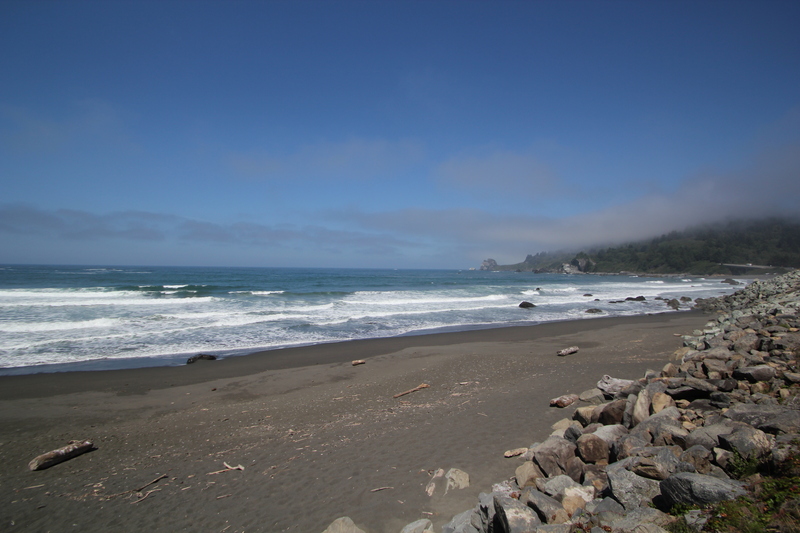 Once we got out of the city traffic the drive along the coast was so enjoyable, it is amazing to be back on our familiar Pacific ocean. 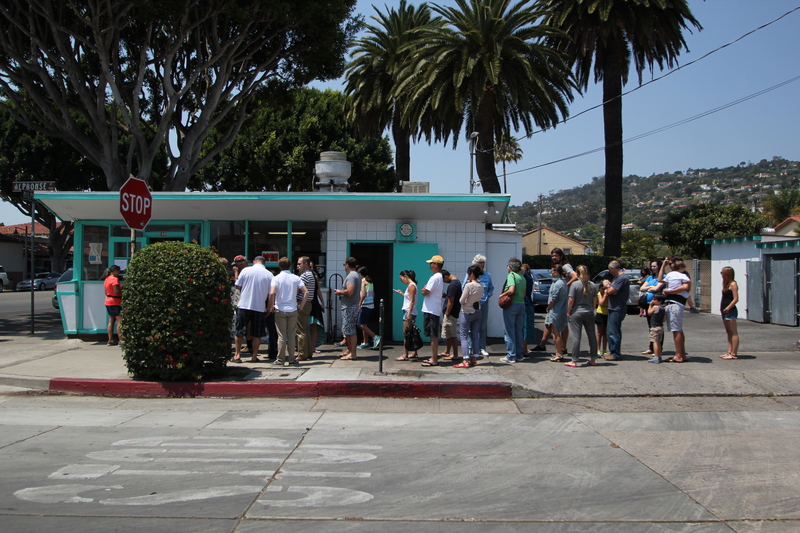 We stopped in Santa Barbara for lunch at an awesome authentic taco joint, with a line down the block. We had just finished our lunch and were starting to walk through town toward the beach when I got a call from a strange phone number, with an LA area code. 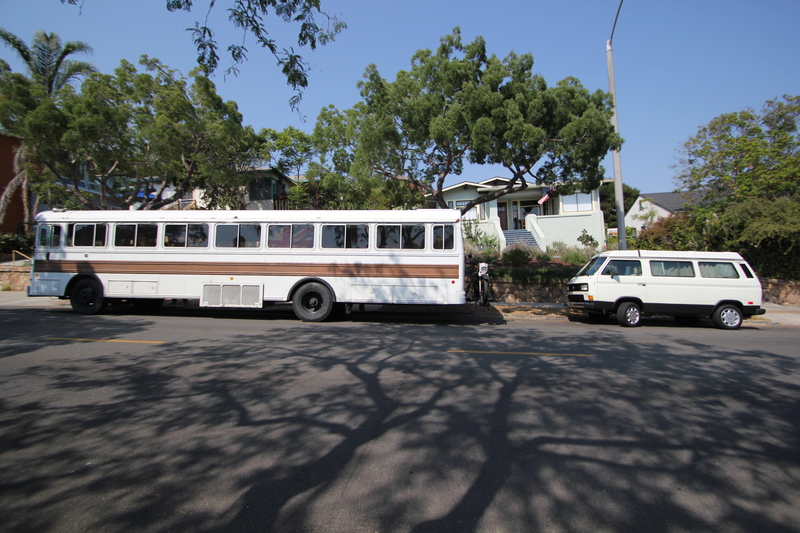 It turned out to be the Santa Barbra police, they had been getting complaints about where our bus was parked and asked us to move it. We were parked legally along the curb so they didn’t give us a ticket, but we were taking up a large section of the street so we were happy to move out of the way. I am just curious about how they got my phone number, as it isn’t anywhere on the bus, and it is licensed and registered in Lindsey’s name. Feels a little weird, but I guess that is what the police do. It would be a lot easier to get around in these small towns in a little VW Westfalia! 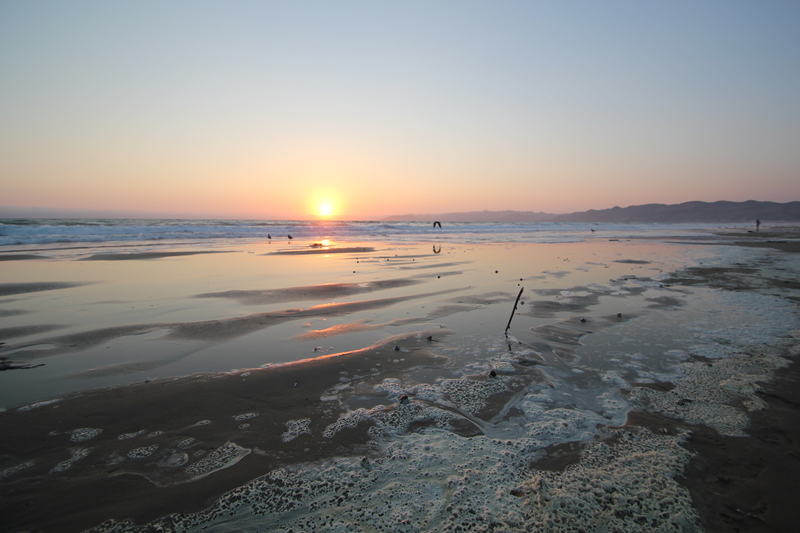 We pressed on up the coast, our stopping goal for the night was Pismo Beach. 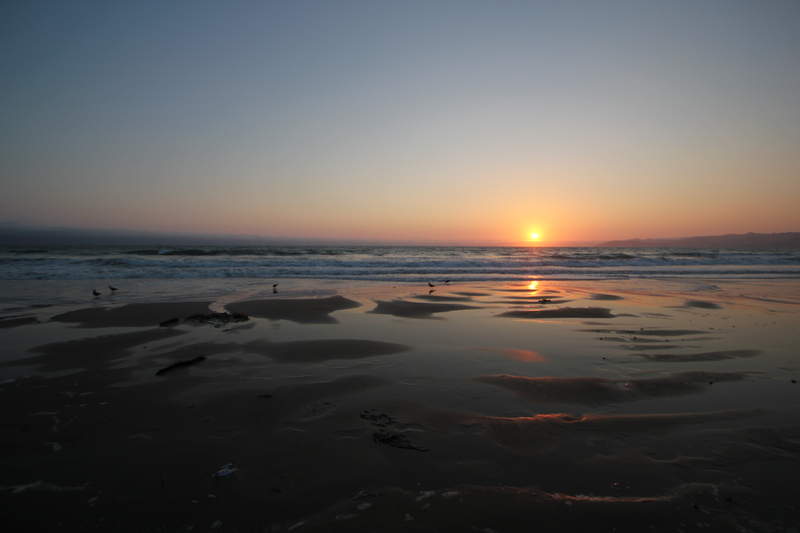 Arriving in the early evening, we drove down to the beach access road in Oceano looking for a place to camp. 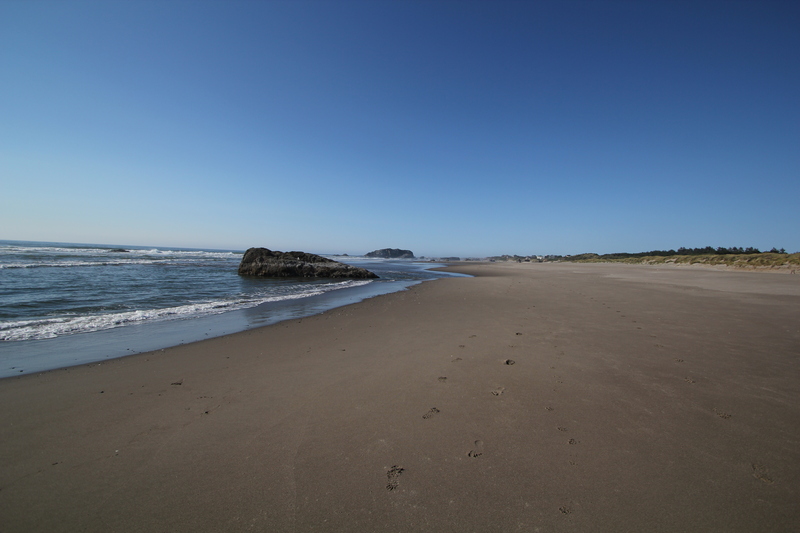 Of course all the state parks where filled up, and the only area available for camping was out on the sand. 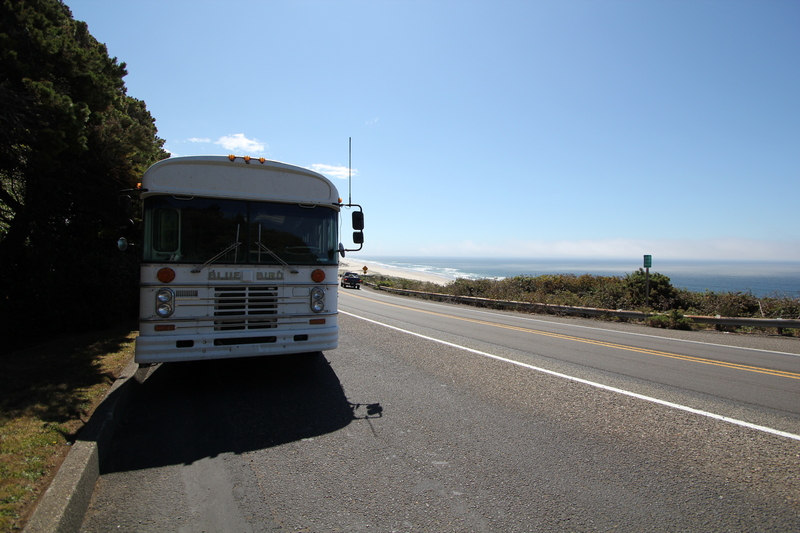 I really wanted to drive out on the beach, but after standing at the top of the hill and watching several other trucks with campers and RV’s get tuck in the soft sand I decided it wasn’t worth the risk. Instead we found a quiet street a few blocks from the beach to park along for the evening. A strange coincidence occurred that night; just after we drove up and parked at the beach we got an instagram message from a guy I knew in Portland, he said he had just happened to open his curtains and look out the window as we drove by his house. He said his jaw dropped in disbelief, and he immediately sent us a message. Jay and I exchanged a couple quick messages and he came out to check out the bus. It was so awesome to see another familiar face, and none of us could believe the random chance that we decided last minute to go to Pismo and he just happened to look out the window at the right time. Jay invited us back to his house to have dinner with his family, so instead of eating leaftovers for dinner we enjoyed delicious local beer and pizza with friends. Funny how the world works sometimes. That night we slept soundly in our big cozy bed, with the cool ocean breeze drifting in the windows. 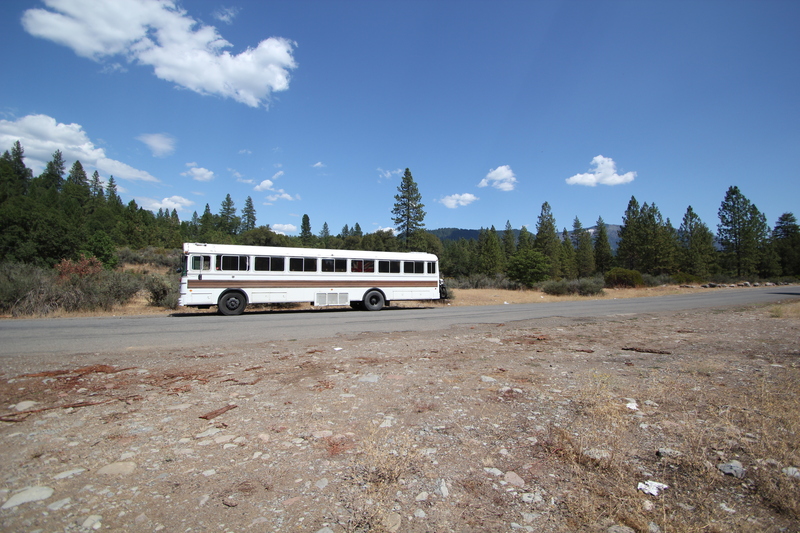 This is what bus life is all about; having the freedom to park most anywhere and have your own little home with you is a very liberating feeling.